After filling out the required documents, I went to FAMI’s head office at PSBank Center Makati City to submit it personally. On the 18th floor, a receptionist checked my forms. After a few seconds, she said that it was already ok. I wanted to hear more than just ok so I asked her if I could talk to a person whom I can ask questions. She called someone. I sat on an empty room and patiently waited. After a moment, somebody came and greeted me with a hand shake. Her name is Sally. Not from the fund manager’s department but from sales. Nevertheless still acquainted with mutual funds and how it works. I deposit my initial investment to MetroBank, then MetroBank transfers it to HSBC since they are required to hand it over to a bank which is not affiliated with them, makes the money more secure. Here comes FAMI’s Fund Managers who decides when and where is the right time and place to invest. They communicate with HSBC and HSBC pays it to the chosen investment by the FMs. Balanced Fundsinvest both in shares of stock and debt instruments. Save and Learn Fixed-Income Fund (SALFIF) conservative investor who doesn’t want too much risk. Doesn’t yield a high return. 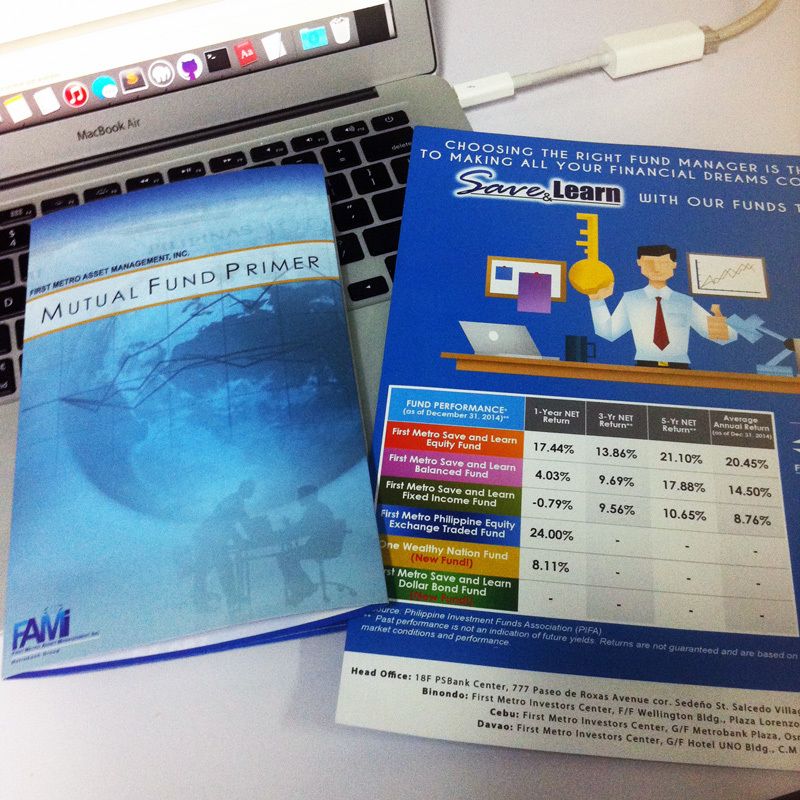 Save and Learn Balanced Fund (SALBF) moderate investor who has between 2 to 5 years before needing the funds. Yields a moderate return. Save and Learn Equity Fund (SALEF) aggressive investor who has ambitious financial goals and doesn’t need the funds for at least 5 years. Yields a higher return. On the last page of AOF there is a questionnaire which determines what kind of investor I am. I asked Miss Sally to evaluate my answers. The result was that I am a moderate investor and SALFBF is the right one for me. 60% investment on stocks and 40% investment on bonds. I think it was because I answered I am comfortable investing my money for a period of 3 to 5 years. I said I wanted SALEF because it will give me higher potential of income. Good thing is she told me that I can still choose SALEF regardless of the results. Awesome! I left the building with a smile on my face and a happy heart. I’m gonna be a stockholder and will be eligible to attend a stockholder’s meeting! So how does that sound? This entry was posted in Daily Me and tagged fami, investment, mutual fund, rich, salef, savings, wealth. Bookmark the permalink.